The UGA College of Agricultural and Environmental Sciences released ‘Avalon’ in 2016. 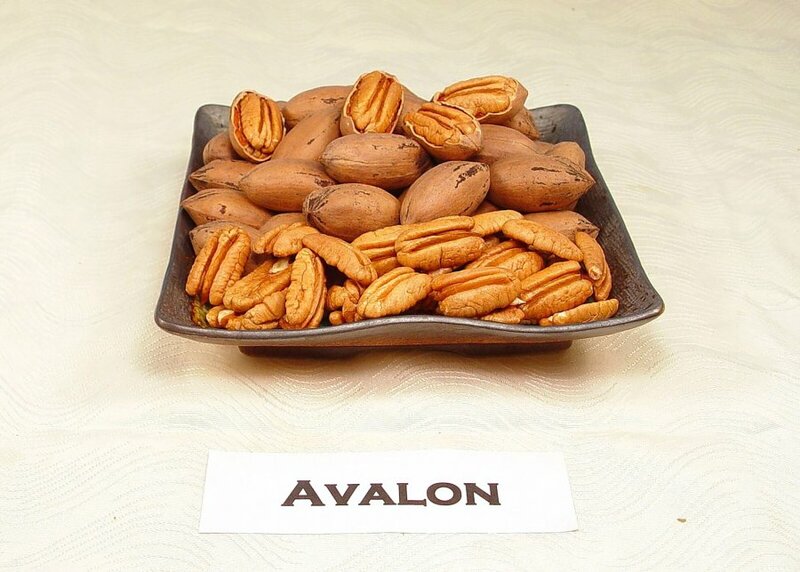 Since 2012, Conner has conducted on-farm yield trials comparing ‘Avalon’ to ‘Desirable’, a cultivar known for its large nut size but high susceptibility to scab disease. Rain exacerbates scab disease because it thrives in wet, humid conditions. If scab infects the nut in the early stages of development, the pecan may fall off. It can also cause leaf loss and produce black lesions on the pecan shucks any time during the growing season, which will reduce nut size and cause yield loss. In 2018, Conner advised his cooperating grower, Shiloh Farms, to apply only seven spray applications to the test plot, as opposed to 15 applications in surrounding fields. In the test plot, ‘Desirable’ suffered significant leaf scab infection and nut scab, resulting in quality and yield loss. The ‘Avalon’ variety remained scab free and its yields were three times greater in 2017 and six times greater in 2018. “It’s very encouraging to see these results because the cultivar’s resistance to scab is the main reason that I released ‘Avalon’. However, you always know as a breeder that eventually the resistance is likely to be overcome, at least to some extent, so that is why it is encouraging to see that yield and quality look good in ‘Avalon’ as well,” he said. Next Conner plans to advise Shiloh Farms to reduce the chemical treatments for ‘Avalon’ to four or five applications this year. UGA Cooperative Extension pecan specialist Lenny Wells believes Georgia producers lost at least half of their crop this year due to Hurricane Michael’s impact in south Georgia on Oct. 10. A crop that was estimated to produce between 90 million and 100 million pounds in 2017 will struggle to reach 50 million pounds, according to Wells. Combined with extremely low market prices, due in large part to China tariffs, growers who are looking to start over will be searching for ways to reduce input costs, he said. “Right now, ‘Avalon’ requires one-third or less of the fungicide applications that a susceptible cultivar like ‘Desirable’ needs, so that is one way to reduce input costs. Having a variety like ‘Avalon’ in their planting scheme may also allow growers to save time so they can concentrate on spraying the more susceptible cultivars when they get an extended wet period like we saw in 2018,” Conner said. Chemical applications are expensive. In 2014, estimates for 16 fungicide sprays at $16 per acre amounts to $256 per acre for the whole season. “Growing a resistant cultivar such as ‘Avalon’ should result in lowering this input cost by one-half to one-third, as well as reducing negative environmental impacts,” Conner said. For up-to-date information about Georgia’s pecan industry, see site.extension.uga.edu/pecan.